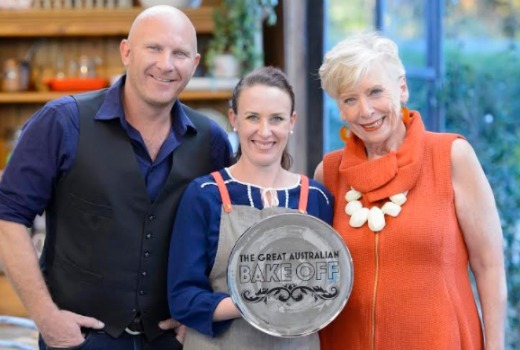 Olivia McMahon has won the 2016 season of The Great Australian Bake Off. The 37-year-old waitress from Brisbane beat Monica Cavallaro, 44 from Sydney, and Antonio Marcora, 17 from Sydney. She proved too strong for her competition, baking an extravagant, three-tiered pina colada cake. “I can’t believe I’ve won, especially when I was up against such stiff competition from Antonio and Monica. My goal when I started was just to make it past week one, so to win is an absolute dream come true,” she said. As well as the series title McMahon will see one of her recipes featured in Delicious magazine in March. The LifeStyle series will return in 2017 and is now looking for a new batch of amateur bakers. Last week Maggie Beer won the AACTA Subscription Television Award for Best Female Presenter at the AACTA Awards Industry Luncheon. Another great season of this show, with such deserving final 3 contestants. This is how to make a cooking competition program! One episode a week, tightly edited and none of that fake drama, heroes, villains, pretend romances, and out of context footage and comments you see in MKR. This is just people doing their best, and being shown for who the really are, not portrayed in a way to win ratings. Agree totally, such a great show with none of the fake drama or unnecessary padding MKR peddles out. Bake Off is a very close second to Masterchef!